Are you wearing enough flair? 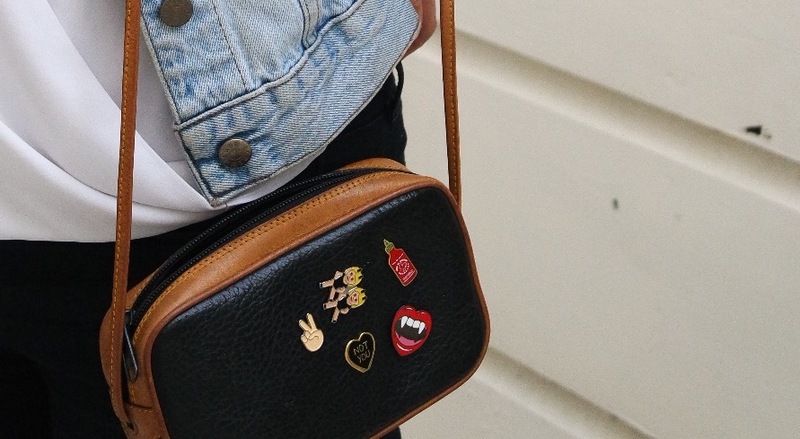 For example, I've already seen a full page spread on a "flair" covered leather jacket and this Anya Hindmarch sticker bag has been popping up all over NYFW. Pins are very personal, and the best ones reflect you. If you hated unicorns, you would never put a unicorn in your sticker book. This is like a more expensive, wearable adult sticker book. Here they are on one of my vintage etsy purses (YES, pins leave holes, so don't stick them in anything too valuable, mmkay?) I feel like they took a very simple outfit and made it into something surprising and fun, that represented me. And isn't that what "Fashion" is all about?